A question from Jim Westergren caused by looking at an oddity in Google PR reporting prompted me to look at the relevance rating in Google Mini search results. For each search you do on the Mini/GSA, you get back a variety of information for each page. Not all of this is immediately obvious – there’s a last modified date which is often pretty useless, and also there’s a relevancy rating for each page. If you’re using the XML API, you’ll find the relevancy within <RK>. Jim asked if the RK rating was always the same, or different for each page. I’ve done some checking, and it is different in the Mini, and the rating for each page depends on what you have searched for. For instance, on one search, a page I was following was rated as ‘5’, in another, it was ‘0’. This means the RK value could be useful in a set of results, although as by default the results are ranked by relevancy so what the box thinks is the most relevant is at the top of the results, it’s probably not greatly useful. When sorting by date it becomes more useful, as you can try to spot the most relevant page in whatever results you happen to be looking at. It should not be seen as a version of PageRank (‘PR’) within the search appliances, because the value is not fixed across all searches. As posted about earlier, there are new Google Minis that can handle 200,000 and 300,000 documents. I was happy to find out today that they can now be bought in the UK for just under £4,000 and £6,000 respectively. How do I spider a protected area with a Google Mini? If you have a protected area of your website, but still want to spider it and have the results available to searchers (e.g. if you have an extranet that you want to offer searching on) then you can give a Google Mini a username and password to give access to the area to spider. For instance, you have used .htaccess and .htpasswd files to protect a directory on your website called ‘clientarea’, and you need to use the username ‘myuser’ and password ‘mypass’ to access it. Click ‘Save URLs to Crawl’ and go to the ‘Crawler Access’ area. In the area labelled ‘Users and Passwords for Crawling’ you need to put the URL of the protected area, and a username and password to access it. If you also need to set a domain for the protected area, fill in that box as well. Click on ‘Save Crawler Access Configuration’ and you’re ready to go. It will remove the password stars from the boxes, but will remember the password. Next time you crawl your sites, it will access the protected area as if it was a user giving over the set username and password. In the search results it will show Titles, URLs and a snippet of the page as usual, but when a searcher clicks on the link they will need a correct username and password to access the area. This will stop the Mini, and any other search engine you allow access to the pages from storing a cached version of the page. They will still show part of the page in the snippet as part of the results, but searchers won’t receive a ‘cached’ link to click on. How do I access the XML from the Google Mini / GSA? As well as the standard web interface, the Google Mini and Google Search Appliance have an XML interface which gives you a results set back in XML. Where ‘www.miniaddress.com’ is the address of your search appliance (this can also be an IP address,) ‘collectionname’ is the name of your collection, and ‘searchphrase’ is what you are searching for. You can set lots of flags in the URL to do things like change the start number of the results set, or change the encoding of the results coming back to UTF-8 or latin. You can look up the various flags in the GSA XML reference. Q: On a webserver I have a directory full of html pages. These pages are NOT listed anywhere. Can the google mini return search results where these html files will also be included? 1. Put the exact URL of each page to be spidered in the list of places to be spidered in the crawling admin – if you have many pages, this will become a maintenance problem. 2. Use a sitemap page which is not indexed by the appliance – the easy way to do it. This means the spider will read the page and follow all links on it, but the page itself will not be indexed. If it isn’t indexed, it can’t be shown in the search results, so no-one can find it. Now give the GSA or Mini the address of this sitemap page to crawl. Any time you add new pages to your site that are not getting spidered, you can add their address to the sitemap page. NB: Google and the other big search engines also follow this ‘robots’ meta tag command, however you will need a link to the sitemap page from another part of your site for them to spider the pages and find them interesting enough to keep in their index, so if you use it to expose pages to the public search engines you will need your sitemap to look prettier as people might click through a link on your website to the page. The [code] changes depending on your appliance – the Mini and GSA I use have different codes. The e-mail address is set to the admin person so you can be contacted if the spidering is going too fast. The bit we’re interested in here is the ‘gsa-crawler’. When you’ve set it to something unique, you can use the robots.txt file of your website to control where it spiders. This can be useful if you want to block areas of sites off for projects, for instance if you’re working on a large site and you have the lowest level Google Mini, you may want to block irrelevant pages from being spidered and using up some of the 100,000 document limit. But it only blocks it off for you, not any other GSA’s spidering the site, and not the big search engines like Google, Yahoo and MSN Search. View/Edit the collection, go to System Status, then Serving Status, Browse the hierarchy of URLs seen during crawl. This will show you a list of the websites crawled. Click the number under ‘Excluded URLs’ for the site where you are blocking content. This will give you a list of URLs which were blocked, pages blocked using robots.txt will have “Crawled with empty body: Disallowed by robots.” next to them – this only happens for pages which have direct links to them from a crawled part of the site, it will not show you other pages in the same section which can only be got to through the blocked area, as it won’t have gone in to that section to find the links to them. Using ‘disallow’ in robots.txt stops anything in that directory being read, and can be used to disallow single documents as well, you can find out more on the robotstxt site, which has an explanation of the standard and example code. Google have released new Google Minis which will index 200,000 and 300,000 documents, priced at basically double then triple the price of the standard 100,000 document Mini. You can buy them in America, but not in the UK yet. Google have a helpful list of the file formats the Google Mini will spider. It’s worth checking what you want to spider before you consider the other factors in why you are buying a search appliance. Checking through the various file formats I have, I was surprised to see the Mini supports .wps files written by Microsoft Works for DOS. It’s not a difficult format to read, but it is an old format now – Works v2 being copywrite 1988 if my memory serves me correctly. Personally I have a ton of old Works files and it’s nice to know something will still understand them, I told Google Desktop they were txt files with an odd extension, but that can have dubious results as some of the file is binary. How does the GSA / Google Mini count documents? The Google Mini has a document limit of 100,000 documents, the Google Search Appliance between 500,000 and 2 million, although you can put several GSA’s together so you can raise that up higher. are all documents. To a developer, the last two URLs may look like the same page, showing different content, to the GSA, that doesn’t matter – they are unique URLs, so they are different documents and will be counted separately. So, with the Mini you get to index 100,000 individual addresses. If you have a dynamic site which shows all it’s content via variables on one address, then each page served dynamically on a different variable is counted as a separate document. A problem with this is that if you are using multiple variables in your URLs and your page / CMS can show the same content under different URLs, you can have the same content spidered several times under different addresses – this is one variety of ‘spider trap.’ If this might happen to your site, you should look at trying to exclude it happening by giving a spiderable path to one set of the content and ignoring others using regular expressions. I’ll try to write more on that soon. What ports does a Google Mini have? 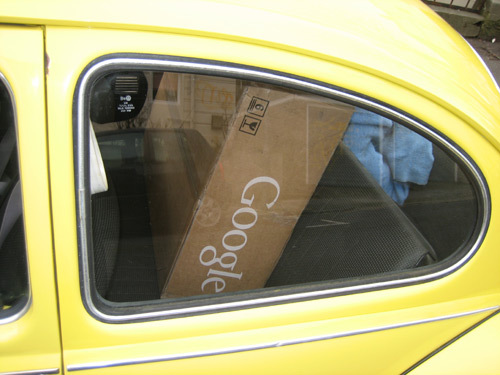 Earlier in the week I picked up a new Google Mini, delivered to our client, to take it over to Nathan for checking and hosting. Everything seems to be OK with it, the admin interface is a little different from it’s larger brother, the Google Search Appliance, but after a bit of sniffing around all the bits I expected are in there. I’d presumed they’d have a practically identical interface to make it easier on the software development team, but apparently not.